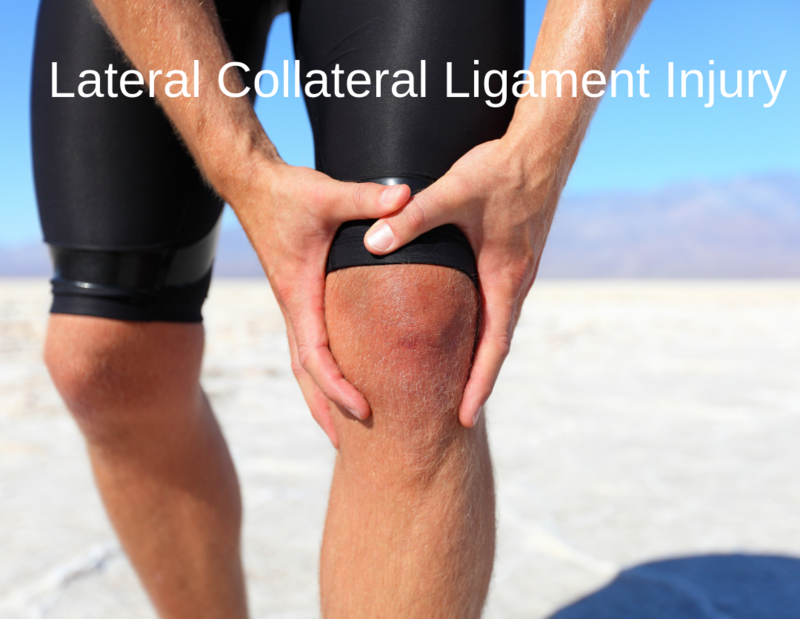 Lateral collateral ligament injury occurs in the knee following a varus force across the knee. This may occur due to a blow to the medial side of the knee or a force that causes hyperextension of the knee. The lateral collateral ligament is the ligament of the knee that originates close to the lateral epicondyle and inserts onto the fibular head. The lateral collateral ligament is often grouped with popliteofibular ligament and the popliteus tendon and are together termed as the posterolateral corner. This posterolateral corner acts as the primary restraint to external rotation stress across the knee. Noncontact varus or hyperextension injury. There would be a history of trauma either direct blow or a non-contact injury resulting stress on the ligament. This kind of injury usually occurs in sports. Or the patient might have got a more severe knee injury, often in a motor vehicle accident. Such patients may have other concomitant injuries too. Pain and swelling are the usual complaints. The patient would have difficulty walking. On examination, the limb might have varying degrees of signs of injuries like abrasions, open wounds, and effusion. If there is a major injury, the further examination is difficult and should not be done. Otherwise, the joint line should be palpated. Anatomical landmarks like quadriceps insertion, patella, patellar tendon origin and insertion, lateral epicondyle, and fibular head should be palpated. This test isolates the lateral collateral ligament. Apply a varus stress to the knee at 30 degrees of flexion. Amount of lateral opening should be noted. Presence or absence of an endpoint should be noted. A comparison to the opposite side should be done. In severe injuries, bony injuries and neurovascular injuries must be ruled out. X-rays are the initial imaging modality. Anteroposterior, lateral, and Merchant views are sought. Weight-bearing anteroposterior view, if the patient is able to bear weight, are preferred. For Merchant view patient is kept supine with knee flexed 45° and x-ray beam is directed caudally toward patella at a 60° angle are obtained. X-rays are able to rule out bony injuries and joint pathologies. Special views allow evaluating patellar tilt and tracking. MRI is a better investigation for ligament injuries. It is able to show a tear in the ligament and even associated injuries to cartilage, cruciate ligaments, and menisci. If lateral collateral ligament injury is part of the bigger injury, other investigations such as arteriogram, nerve studies can be sought. Grade I and II injuries can usually be treated nonoperatively. Grade III injuries are best treated with surgical intervention to prevent instability. Nonoperative treatment includes knee bracing with the knee in full extension. Full weight bearing is allowed with the knee in a brace. Medication for pain is prescribed which mostly consists of NSAIDs. Local application of heat/cold is beneficial. As the pain eases, the patient should start range of motion exercises in the prone position. After 4-6 weeks, sports specific therapy may be begun if strength and range of motion are comparable to the uninjured side. Before return to play, the sportsperson should be pain-free and should have regained full strength and range of motion. In case there are concomitant bony injuries or joint injuries, the treatment of major injuries takes precedence. The patient may be reevaluated for ligament integrity at a later stage in these cases.